They say that suffering is inherent to cycling. The Ézaro viewpoint must be, therefore, one of the Olympus of this sport: uncovered to the general public in the Vuelta a España of 2012, its brutal slopes are a place of pilgrimage for many bicycle lovers who, writhing on the pedals, emulate the squad idols in one of the most emblematic climbs of Galicia. The tremendous slopes of Ézaro do not deceive. 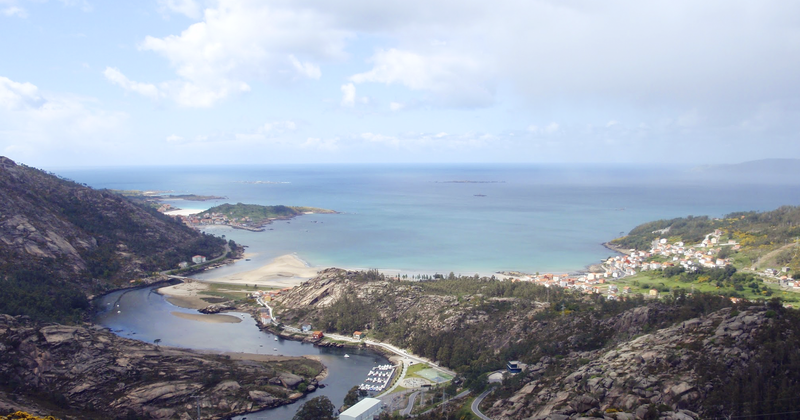 Right at the beginning, at the foot of the small and beautiful estuary formed by the Xallas as it reaches the sea, a signpost warns that the road reaches a steep climb of up to 30%. The truth is that in less than two kilometres the road climbs about 300 meters, rising almost from the beach to the viewpoint, just above the level of the waterfall that the river forms when it rushes down to the sea. It is, therefore, a huge rise in very little distance, that is overcome through impressive percentages. The cycling “party” starts quickly, because as soon as you you enter the road to the lookout the asphalt gets to 16%, without a spot to rest. The inclination is so great and the speed so small that some cyclists will have time to ask passersby if there is much left to the top. And there isn’t long left; just the worst remains. Halfway up the climb is the hardest part, the already famous cement ramp that reaches a 29% incline. The section is only one hundred meters long, but it is a real wall, and whoever is not properly trained or does not have the bicycle equipped with the appropriate gear will end up with a foot on the ground. Once this fatal zone is over, things don’t improve much, especially because, after the effort on the concrete, the body starts to protest. Another steep kilometre, with peaks of up to 18%, remains to reach the top and it takes the cyclist to the viewpoint’s parking lot. Arriving there, after a quarter of an hour or twenty minutes of pushing yourself to the limit, causes a feeling of happiness that makes one understand why more and more people practice this sport. The climb, well known for years by cyclists from the area, became popular after being included in the route of the Vuelta a España in 2012. In its first appearance on the course it was Catalan champion Joaquim Purito Rodríguez who managed to climb it first. His parcial times, and the final one reaching the top, which still hold the record for a competition, are now printed on signposts located by the road. Comparing the times one makes with those achieved six years ago by the Parets del Vallès climber is one of the charming aspects of the route, although, in most cases, the results differ considerably. In 2016, the viewpoint was once again the end of a stage, with the victory of frenchman Alexandre Geniez. Another invaluable reward is the view that can be seen from the top of the viewpoint, in which the force of the Xallas falling between the rocks contrasts with the calm of its final section that leads to the sea, in three curves on which fishing boats float. In the distance is the beach, and all around the mythical Mount Pindo, with its bare skirts, and the beautiful Costa da Morte. ← What is the Rianxeira?